DUBLIN (CRUX) – Just hours after landing in Ireland for the World Meeting of Families, the “pope of the poor” will pay a visit to Dublin’s neediest population where he’ll be welcomed into a very special family, one that holds special weight in his vision of the Church’s role in the world. Established nearly 50 years ago, the Capuchin Day Center for Homeless People tries to put the spirit of St. Francis of Assisi into action through their daily services and contact with the poor. 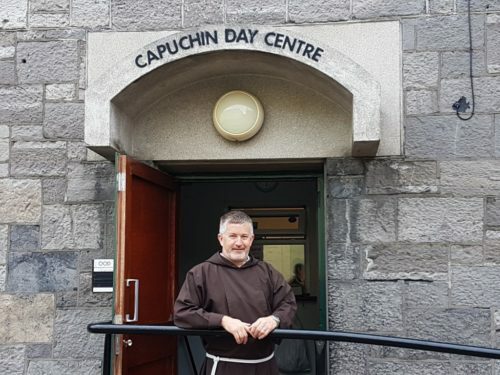 Run by two Capuchin priests, the center is a staple for Dublin’s poor, feeding around 1,000 people a day and staffed almost entirely with volunteers. After Pope Francis touches down for his Aug. 25-26 visit to Ireland, the homeless center will be his first stop after meeting the country’s president, Michael Higgins, and civil authorities. In comments to The Tablet, one of the priests in charge of the center, Father Sean Donohoe, said they are “delighted” for the pope’s visit, and “don’t feel worthy” of being part of the official papal itinerary. Yet they already see him as a natural fit for the community given his choice of the papal name “Francis,” inspired by Francis of Assisi and the saint’s affinity for the poor. “The fact that he chose the name ‘Francis’ is big for us; he’s tried to put a Franciscan emphasis within the Church, and that’s huge. We just see him coming here as a brother,” Fr. Donohoe said, explaining that’s what they try to inspire in the people who come to the center. “We’re not a group of social workers here, we’re a faith-based organization and that’s very important to us. The impression we want to give is that we are brothers to the people who come here. We are family, and the pope is now part of that family,” he said. For the homeless themselves, on a normal day the pope is hardly on their minds, since most of their energies are spent trying to survive. However, his decision to visit the center had a huge impact. Pope Francis is scheduled to arrive at the center around 4:30 pm on Saturday, and he’ll spend about half an hour, if not more, greeting 80 people selected to participate. Fr. Donohoe said he and Father Kevin Crowley, the second friar who officially oversees the place, extended invitations and anyone was free to accept. Father Donohoe said there’s no formal plan for the visit, and the schedule will depend on what the pope wants to do. “We don’t know what’s going to happen, but we’re looking forward to it,” he said. Donning brown habits with large hoods, the Capuchin friars received pontifical approval for their way of life in 1525. Services offered at the Dublin homeless center include a daily open-door buffet for breakfast and lunch, food basket services to poor families once a week, and a donation center that offers the poor different products on different days of the week such as products for babies and mothers. The center receives no support from the government, and so depends entirely on fundraising events and donations, either from individuals or organizations, who provide financial assistance or food and clothing products. Medical and hygiene services are also offered. A nurse and a doctor come to the center three days a week, a dentist twice a week, and a group of barbers once a month. Although the center offers no space for sleeping, they do have showers available for those who want to clean up. Eugene Rider, who has been a volunteer at the center for 14 years, said that he finds the experience “rewarding,” saying he got involved after retirement because he wanted to do something meaningful. “The first thing is, I think I’m helping me, and then as a consequence of that, I’m helping [others],” he said. Though many of the homeless initially might seem cold or standoffish, they are actually “really nice people,” he said, adding that many are very private, which the volunteers try to respect. Rider, who’ll participate in the meeting with the pope, said that if he gets the chance to say something, he’ll tell Francis to be more vocal and more quick to take action on the abuse crisis. “I’d say you’re doing a really good job, but you need to say something serious. Action needs to be taken, like somebody gets fired or something,” Rider said, pointing to gruesome stories of abuse and cover-up in a recent Pennsylvania grand jury report into clerical abuse. “We need more Father Seans and Father Kevins,” he said, referring to the Capuchins who run the center. Caring for people on the peripheries, he said, is the most important work the Church does. Father Donohoe said the number of poor and homeless in the area has increased in recent years, in part due to the economic crisis and a sharp increase in rent, as well as an increase in people coming in from other countries. When the center first opened, they were feeding just 50 people a day. Even two years ago, serving 500 people a day “would have been big,” he said, whereas now that’s considered a slow day.